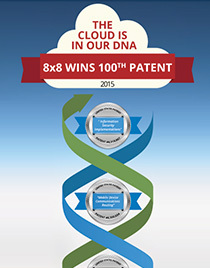 8x8 Celebrates Cloud Innovation—and 100 Patents | 8x8, Inc.
Why should you care whether your business communications provider develops its own technology—or whether it has one patent or 100? Do patents even matter anymore, in an era of ultra-fast, rapid-development technology introductions? 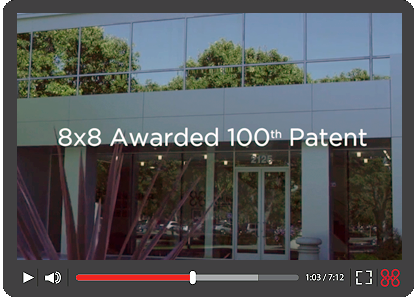 And does 8x8’s just-announced 100th patent amount to anything more than bragging rights? If you’re busy trying to run a business in today’s global, fast-paced, technology-saturated world, these are logical questions. People don’t buy communications systems—or anything else for that matter—based on how many patents its maker develops. When was the last time you heard a car salesman say, “It’s got 437 patents under the hood. Yup, it’s a real beauty all right”? But companies that do their own innovation—rather than licensing whatever is currently on the market—can make real their vision about long-term trends and deliver products and services that respond to customers’ developing needs. Homegrown innovation can also give companies greater control over product pricing, bringing customer costs down. “Unlike many of its competitors, 8x8 leverages a patented homegrown platform which has enabled it to rapidly and economically innovate and deliver an extensive communications-and-collaboration applications set that ranks among the most compelling hosted communications offerings in the industry,” says Elka Popova, North American program director for unified communications and collaboration for Frost & Sullivan. Many unified communications experts agree that controlling the direction of its R&D has direct customer benefits. 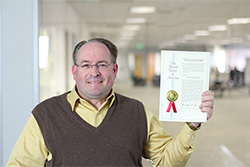 “Patents help companies find ways to innovate that go way beyond just the same old feature sets, creating whole new ways to help customers become more productive and manage their businesses better,” says Blair Pleasant, president and principal analyst of COMMfusion LLC and a co-founder of ucstrategies.com, an industry resource on the growing UC arena. And if a product feature isn’t working quite right for a particular application, the innovating company has all of the software it needs to fix the issue, instead of having to wait for a third-party vendor. “Doing our own R&D really gives us control over how we improve the user experience,” says Bryan Martin, CTO at 8x8. “Without a strong innovation program, you’re at the mercy of industry fads, and you can’t do the right things for your customers,” he says. “Also, 8x8’s innovations frequently come from designers and engineers anticipating how to solve or improve a business issue for a customer, before the customer even realizes the need for such an innovation. We are always looking ahead to see how we can serve our customers better in the future,” says Martin. One of 8x8’s early patents (US 7,035,935 B1) shows just how important it is even for small and midsized companies to do their own research. Technology embedded in a prototype version of Virtual Office received a patent for its ability to control call flow and forwarding now helps to ensure that 8x8 customers can get their calls anywhere they have wireless or Internet connectivity—even if they’re half a world away. DIY R&D is a trend and longtime 8x8 practice that others are starting to follow. 8x8’s own research and development efforts have evolved over time, as company management realized that the needs of businesses were changing. That’s why of the company’s more recent patents relate directly to solving the problems of managing communications and business processes across multiple devices, offices and even countries, rather than some of the video processing and signal processing inventions of its early years. The bottom line, according to Martin, is that customers can count on 8x8 to provide a stream of innovation as technology and business needs evolve. 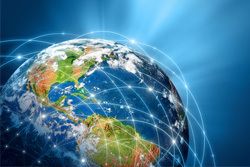 As globalization and complexity increased, Martin says that 8x8’s R&D and subsequent patents have become more focused on solving today’s globe-spanning problems: optimal call routing, unified and mobile communications, networked and global contact centres, emergency services provided over Internet Protocol (IP) connections, improving call quality, disaster recovery, security and global calling platforms. These innovations, he says, make it possible for 8x8 customers to do business anywhere, and to run global operations such as “follow-the-sun” contact centres for worldwide customer support. So, for example, if you’re managing customer service programs that span time zones and geography, you want to route calls through the nearest data centres. It makes no sense for someone calling from Europe to have their calls routed through a US data centre and then back to another European destination .That only slows down the communication and degrades call quality. If it’s bad enough, people really notice the delays. To fix problems like this, the company has done creative work that led to a “geo-routing” patent that helps 8x8 to route calls through the nearest available data centre, something that is really important for companies trying to do support across time zones or country boundaries. Security and compliance are also a key area of development, and here, too, 8x8 customers notice big differences in what 8x8 can offer, compared to competitors. For example, previous work in these areas has helped 8x8 offer a HIPAA solution unmatched by others, making Voice over Internet Protocol (VoIP) a viable solution the entire medical ecosystem of companies—healthcare providers, their business associates and suppliers, pharmaceutical and insurance companies—that must comply with medical privacy laws. 8x8’s patents and other work in security and compliance add up to a major win for 8x8 customers, since 8x8 is the only major VoIP provider that advertises that it can provide customized documentation of HIPAA compliance to its subscribers. 8x8’s hundredth patent concerns the extremely current problem of data handling where multiple clients are accessing a server, which is a critical aspect of solving the worldwide problem of securing business information from bad actors. As the latest in a series of such patents, it is part of the technology that makes 8x8 communications attractive to such security-savvy companies as FishNet Security, a current 8x8 customer. How Will the Next 100 Patents Affect the Way Businesses Communicate? As personal devices and companies evolve, Martin says the company’s patent strategy will adjust as well. Many of 8x8’s current patent initiatives focus on integrating the many services that businesses need to do business globally. “We expect that the Company’s next 100 patents will focus on topics related to new integrated communication applications, global reach and control of distributed enterprises, security and compliance, mobility, communications quality and automatic integration with other cloud services,” he says. Already, some of 8x8’s integration work has paid off, impressing many business decision-makers with 8x8’s ability to create an easy-to-use service with elements that simply work well together. 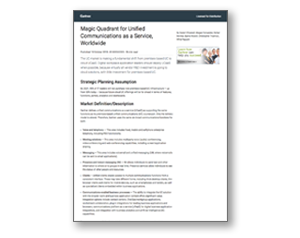 See how 8x8’s cloud communications R&D is transforming the way businesses communicate.